The Samsung WB750 is a powerful compact package which boasts some unmatched features in this size and price range. With a plethora of creative options, good image quality, and blazing fast performance, the WG750 is touch to beat in the compact Super-zoom category. It does however shot a bit more noise than we'd like to see. Read more in our Full Conclusion. In September of last year (2011), Samsung announced the launch of the longest lens to ever be implemented in their compact camera series, the WB750. Highlights include a 12.5-megapixel Back Side Illuminated CMOS sensor (1/2.3 inches), an 18x optical zoom Schneider lens (24x digital zoom with Samsung's Smart Zoom technology), 10 frames per second continuous still image capture mode, and Intelligent Face tracking. Home movie enthusiasts will enjoy capturing Full 1080p HD movies with the ability to snap 10-megapixel still shots during movie recording. The WB750 also includes three different in-camera Panorama modes as well as in-camera High Dynamic Range functionality. The first Panorama mode is called Action Panorama, and is designed to capture movement within a single frame. Next there is Live Panorama in which, much like Sony's Panorama capture, users pan or sweep the camera from side to side to capture a large group of people or epic vista. The last Panorama mode is a 3D version of Live Panorama; the camera only has one lens and sensor, but can splice together multiple images to build the 3D effect. Smart Auto 2.0 builds on Samsung's earlier Smart Auto technology. Though the camera features Full Manual functionality, Smart Auto 2.0 helps novice shutterbugs by detecting shooting conditions and automatically selecting the best mode (16 in still-image capture; 4 in movie recording). Smart Filter 3.0 has a new host of creative special effects to help customize shots. They may be applied before or after taking a picture, and include: Ink Painting Color, Oil Paint, Cartoon, and Cross Filter. After your custom shot it capture, WB750 owners have the option of adding a Magic Frame border (Wall Art, Old Film, Ripple, Full Moon, Old Record, Magazine, Holiday, Classic TV, and more). 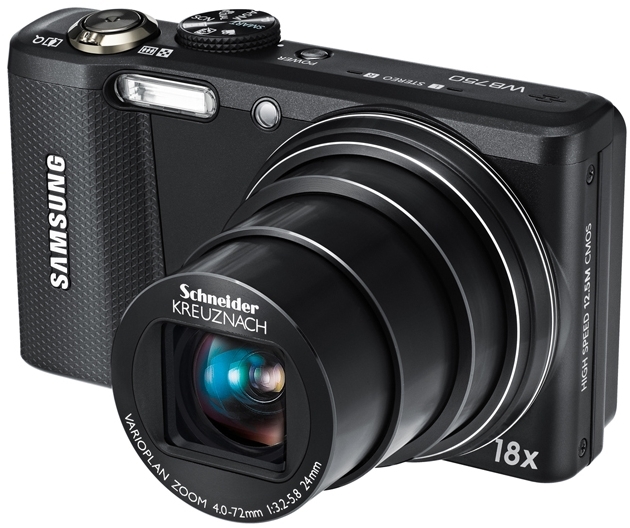 The Samsung WB750 is available now with a street price of about $179.99 USD. For the most current online pricing, check our buy box below.